Legumes and Grains to the Rescue! 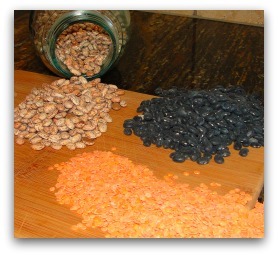 Among the more-common legumes are lentils; pinto, black, and kidney beans; mung, navy, and lima beans. But there are many, many others as well: adzuki, butter, and calico beans; cannellini, great northern, and soy beans; edamame; garbanzos; black-eyed and split peas...not to mention the fabulous scarlet runner bean! Just for starters. Click here for a broader description of beans. Generally speaking, legumes tend to be delicious even when quite simply prepared. And if you get a little creative and/or adventuresome, they sometimes taste better still. Pasta e fagioli, southwestern black bean soup, refried pinto beans with some embellishment...any of these are wonderful, and there are so many more. In fact, would you believe black-bean brownies? Check 'em out! General Note: Please be sure your beans are cooked thoroughly before you eat them! Toss any of these into salads, or use them as a base for casseroles or as a "nest" for stir-fries or sauces; even eat them by themselves. Cooked wheat or oat groats, for example, make a terrific breakfast cereal, as do sautéed steel-cut oats (pre-cooked) and quinoa, which weighs in at 8 grams of protein per 6.5-ounce serving. 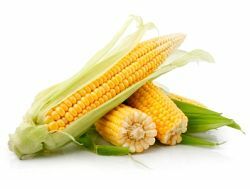 Really, your options are virtually endless with grains; you just need to use a little imagination...and planning ahead can be useful, as well, as grains take a while to cook. To fully access the protein from your grains, some nutritional experts advise mixing them with legumes or another protein source. And vice versa. Although the turtle and I have conducted an oddly fruitless online search for a good real-time protein counter, perhaps you’ll have better luck yourself. I hope so. If not, this book of "food counts" might do the trick for now. It's the one I use myself. Meanwhile, something to remember with vegetarian protein is that the grams do add up. Not as quickly as animal protein, obviously, but in the same way. With a little planning and foresight, you can do quite well with vegetarian protein sources such as these: seeds/nuts, dairy, soy products, seitan, and even veggies. Enjoy the ride! And if you want some veggie burgers on that ride, click here!